And he didn’t idolize players on the Pittsburgh Steelers or the Cleveland Browns. In the Christodoulou household, it was all about the Carlton Blues. Christodoulou is a native of Melbourne, Australia, and a veteran of Australian-rules football — a sport with roots in early forms of Rugby and Gaelic football, with some elements of American football and soccer as well. In Australian-rules football, also known as “Aussie Rules” or “footy,” two teams of 18 players compete on a large oval-shaped field with an oval-shaped ball and little-to-no padding or equipment. They try to score points by either kicking the ball into the goal square between the two goal posts — worth six points — or by getting the ball past the two behind posts by any means for one point. “Footy” is a fast-paced game without stoppages, and everyone on the field has to be adept at running with the ball and kicking it at full speed while avoiding tackles from all angles. Aside from the tackling and catching aspects, there’s not much a typical NFL fan would recognize. 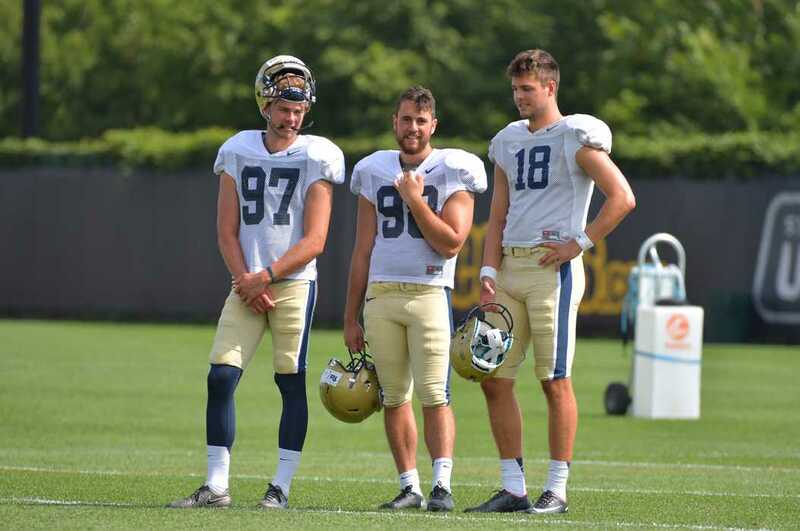 Now at Pitt, the 20-year-old Christodoulou is attempting to become the next in a long line of punters to successfully transition from the Australian-rules game to American football. Christodoulou was exposed to Aussie Rules football at an early age via his father’s immense fandom for his local team, the Carlton Blues — one of the eight founding member clubs of the Australian Football League. “It’s a game that I grew up with … that culture of loving footy, and looking forward to that every weekend was sort of ingrained to me at a young age,” Christodoulou said. Although Christodoulou’s father loved the game and his Blues, he never played it competitively beyond his childhood. But it didn’t take long for Christodoulou to realize he had a knack for it. Playing a game at his local club, he sent a booming kick all the way beyond the other team’s back line. Someone immediately suggested he look into punting, and told him to give Nathan Chapman a call. Chapman, a former professional punter in the AFL, heads the renowned Prokick Australia program along with John Smith, a former NFL and CFL kicker. The program has developed dozens of Australian punters who have transformed into college football and NFL standouts over the last several years. All three finalists for last year’s Ray Guy Award — given to the best punter in college football — were veterans of the Prokick Australia program. And Christodoulou now shares a practice facility on the South Side with the area’s most famous Prokick Australia product, someone he’s already very familiar with — Steelers punter Jordan Berry. Christodoulou began training at Prokick Australia when he was 17 and continued through the rest of high school. He then took a gap year to focus specifically on training while Chapman and Smith sorted through the offers coming in from schools in the States, trying to find the right fit for him. Last summer, a scholarship opened up for the Panthers, who were in need of a punter for the future. So Pitt running backs coach and special teams coordinator Andre Powell got in touch with Chapman and Smith. Knowing the wonders they’ve worked for the other punters to make the journey stateside, Christodoulou put the future of both his education and football career in Chapman and Smith’s hands. Despite his extensive background in the Aussie Rules game, Christodoulou said he prefers the traditional style of punting — but if Powell ever needs him to break out a rugby-style punt, he’s more than ready. Christodoulou gave his verbal commitment to Pitt in July 2016, then made the 10,040-mile journey from Melbourne to Pittsburgh in January to enroll early and get a head start on preparing for the season. One thing he didn’t prepare well enough for, though, was making his bed at Sutherland Hall. That’s when having a particularly well-off friend in the area came in handy. Christodoulou has adjusted to life as a first-year student thanks to an assist from Berry, but he still says it’s a bit weird living in Sutherland. Once he got settled in as a college student with proper bedding, it was time for Christodoulou to find out how to prepare for his first season of college football. That’s where he benefited from having another friend to look up to — Pitt’s senior punter Ryan Winslow. Winslow was happy to oblige and take Christodoulou under his wing, even though he knew he would have to compete with him for his starting spot. After getting in 14 spring practices to shake off the nerves, Christodoulou put on a navy blue Panthers jersey and ran out the tunnel onto Heinz Field for the first time at Pitt’s Blue-Gold Game April 15. Competing for the Blue team while Winslow punted for the Gold, Christodoulou averaged 39 yards per punt on six attempts with a long of 49 yards. Winslow, meanwhile, kept his hold on the starting job by averaging 42 yards on five punts with a long of 50 yards. Still, Christodoulou showed that he’s not far behind the senior, who already has three full seasons of punting experience with the Panthers. Barring an injury, Winslow will remain the team’s starting punter throughout his senior season, allowing Christodoulou to take a redshirt year and still have four years of eligibility remaining. After a full year with Powell and Narduzzi at Pitt, Christodoulou should be all souped up and ready to go for the 2018 season and beyond. For now, Christodoulou will continue to observe Winslow and find out what it takes to make it through a full college football season while trying to meet the requirements of transferring into the Swanson School of Engineering. And once he does make it onto the field, punt returners beware — this punter is no stranger to contact. Behind his beaming smile and playful demeanor lies a player steeped in the tradition of non-stop, full-contact “footy” — albeit against slightly smaller opponents.